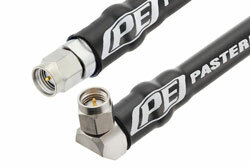 PE342 is a SMA male right angle to SMA male cable using PE-P142LL coax. This Pasternack SMA male right angle to SMA male cable assembly uses a 50 Ohm SMA for connector 1 and a 50 Ohm SMA for connector 2. SMA right angle to SMA coaxial cable assembly uses 90 degree right angle coax cable connector. Our male SMA right angle to male SMA cable assembly uses a flexible cable type that is 50 Ohm. 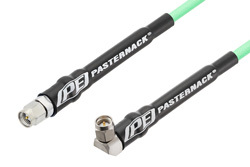 Pasternack PE342 SMA male right angle to SMA male cable assembly is constructed with PE-P142LL coax.